Did you know that February 2nd until 8th is Bramley Apple week? Can I please have a bit of apple pie that's this big?! Did you know these facts about Bramley apples? They were first grown by another young gardner. 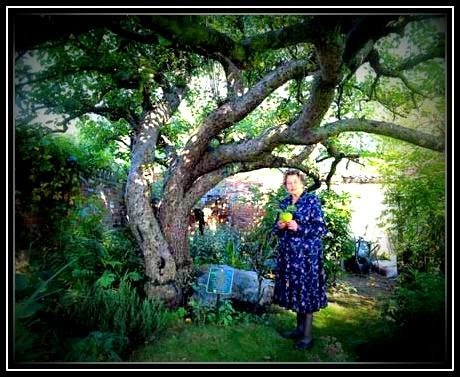 School girl Mary Ann Brailsford grew them from some apple pips in her garden in Southwell, Nottinghamshire, England in 1809. That tree was still alive and bearing fruit 200 years later- wow. That is really, really, really old! Bramley apples have less sugar in them and more of something called malic acid. That means you can still taste their strong tangy flavour even after cooking, yum! Bramleys have more water in them than other apples. This means they have a very yummy soft texture when cooked, double yum! Bramley apples (and all other apples) float in water as 1/4 of them is made up of air! Apples are actually members the rose family. That's really weird as they look nothing like each other, do they? 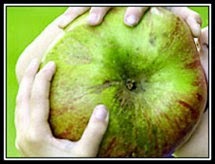 Some Bramley apples grow to be more than 1kg in weight and measure 45cm round. That's almost the size of my head! Look how huge this Bramley is!! Bramleys can be used in all sorts of recipes from soups and curries to burgers and cakes. And of course my favourite, apple pie. Daddy cored this one- I'm just doing quality control! Roll out your pastry- it is just like edible play-doh! Allow to cool slightly and enjoy! Hope you enjoyed finding out about Bramley apples and that you make something with them this week. I'd love to hear about what you cook.